Our second day of sightseeing was interesting and again wonderful. 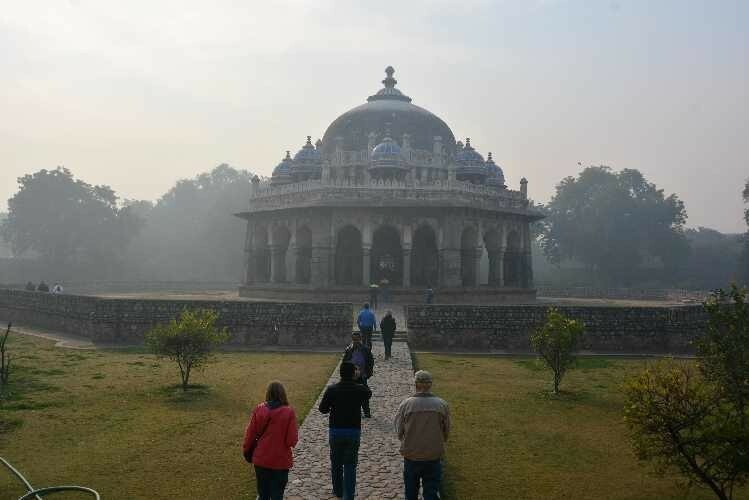 We started the day with a visit to Humayan's Tomb. 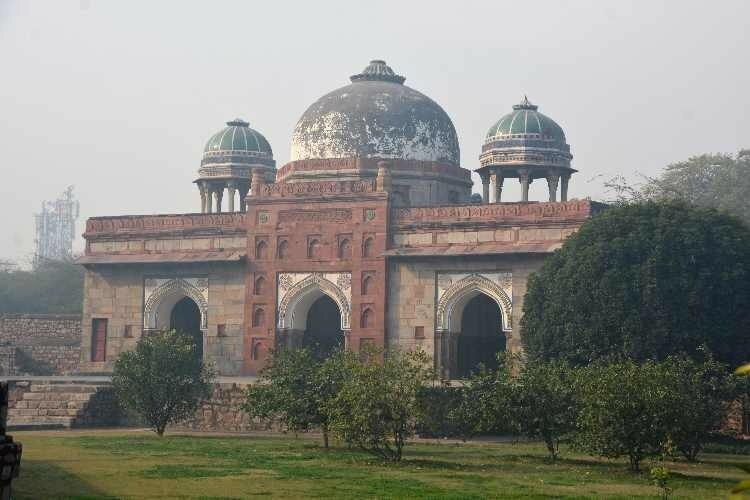 The tomb is the tomb of the Mughal Emperor Humayun in Delhi, India. 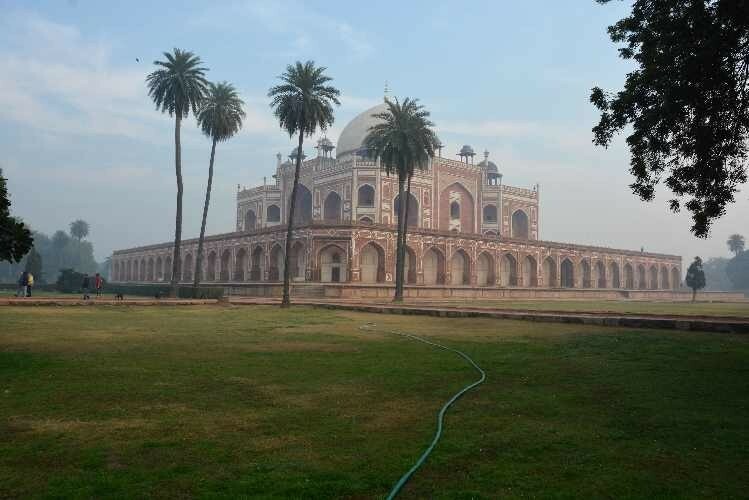 The tomb was commissioned by Humayun's first wife and chief consort, Empress Bega Begum (also known as Haji Begum), in 1569-70, and designed by Mirak Mirza Ghiyas and his son, Sayyid Muhammad, Persian architects chosen by her. 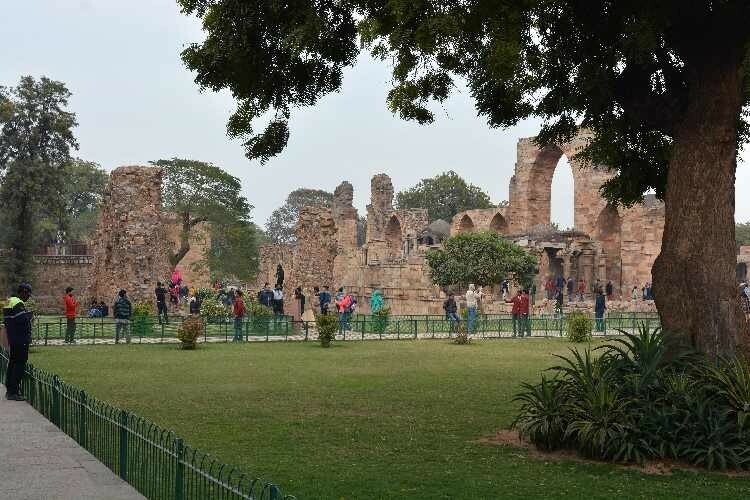 It was the first garden-tomb on the Indian subcontinent, and is located in Nizamuddin East, Delhi, India, close to the Dina-panah Citadel, also known as Purana Qila (Old Fort), that Humayun founded in 1533. It was also the first structure to use red sandstone at such a scale. 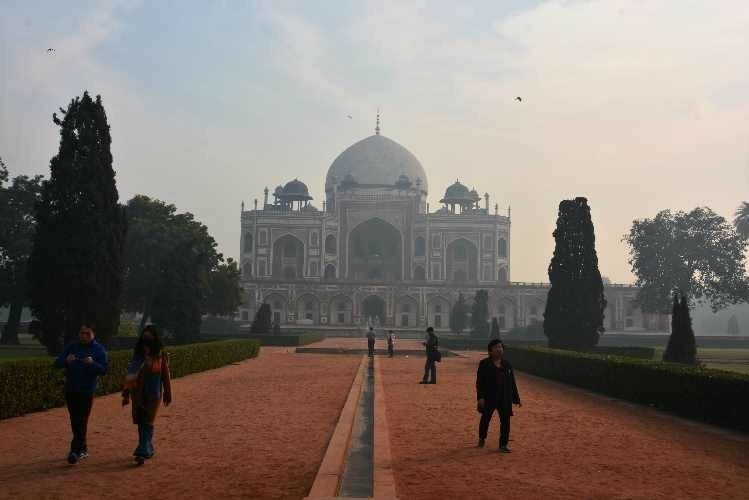 The tomb was declared a UNESCO World Heritage Site in 1993. The complex encompasses the main tomb of the Emperor Humayun, which houses the graves of Empress Bega Begum , Hamida Begum, and also Dara Shikoh, great-great-grandson of Humayun and son of the later Emperor Shah Jahan, as well as numerous other subsequent Mughals, including Emperor Jahandar Shah, Farrukhsiyar, Rafi Ul-Darjat, Rafi Ud-Daulat, Muhammad Kam Bakhsh and Alamgir II. 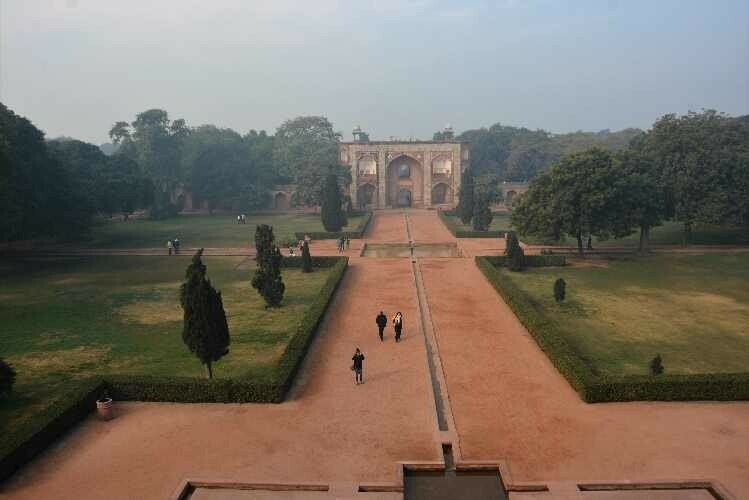 It represented a leap in Mughal architecture, and together with its accomplished Charbagh garden, typical of Persian gardens, but never seen before in India, it set a precedent for subsequent Mughal architecture. 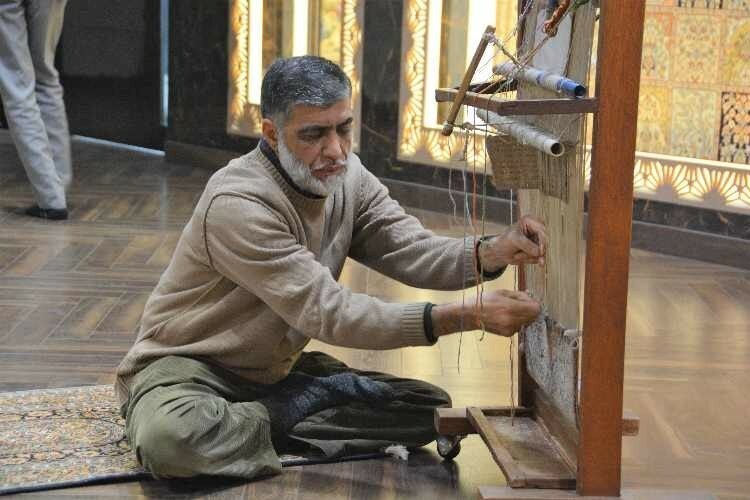 It was then off to a carpet demonstration about Kashmir carpets - a skill the will vanish within the next 20 years as non of the younger generation is interested in keeping up the centuries old, labor intensive skill. 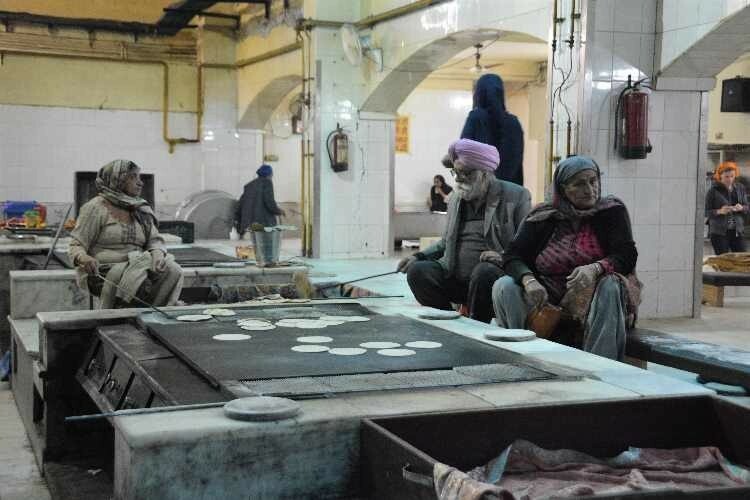 We then visited the Gurudwara Bangla Shahib, Delhi's largest Sikh house of worship and kitchen. 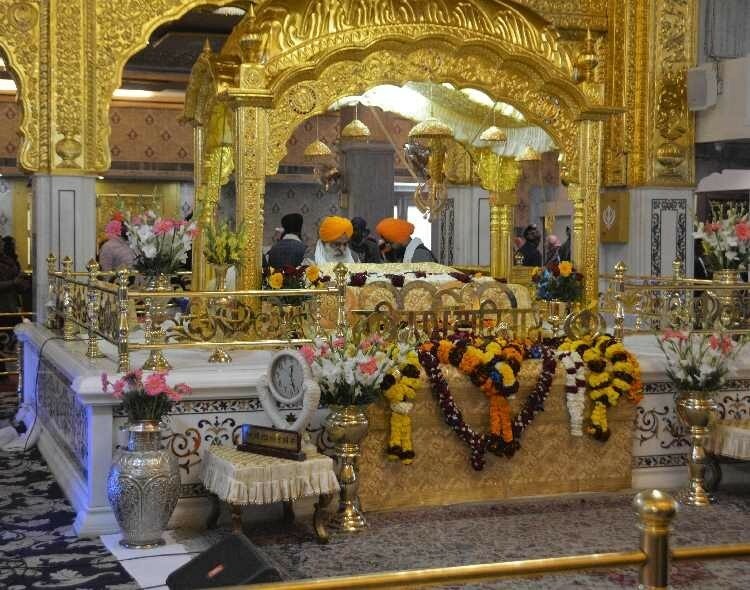 They feed at no charge continuously from midday to midnight anyone who enters regardless of faith or prominence. 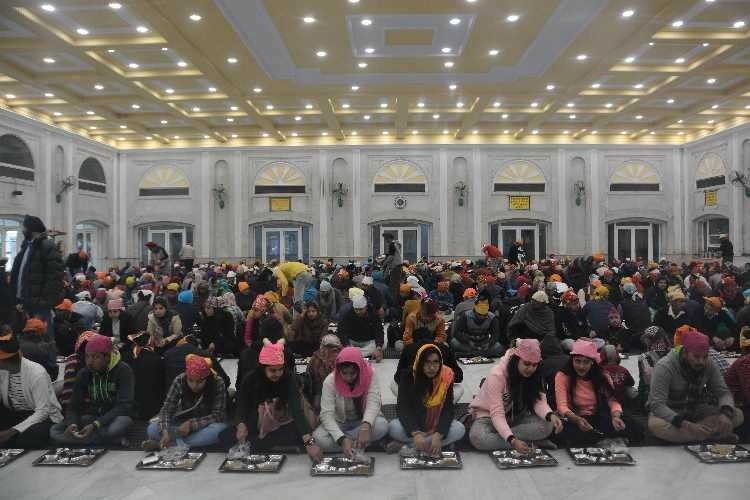 It is one of the most prominent Sikh gurdwara, or Sikh house of worship, in Delhi, India and known for its association with the eighth Sikh Guru, Guru Har Krishan, as well as the pool inside its complex, known as the "Sarovar." 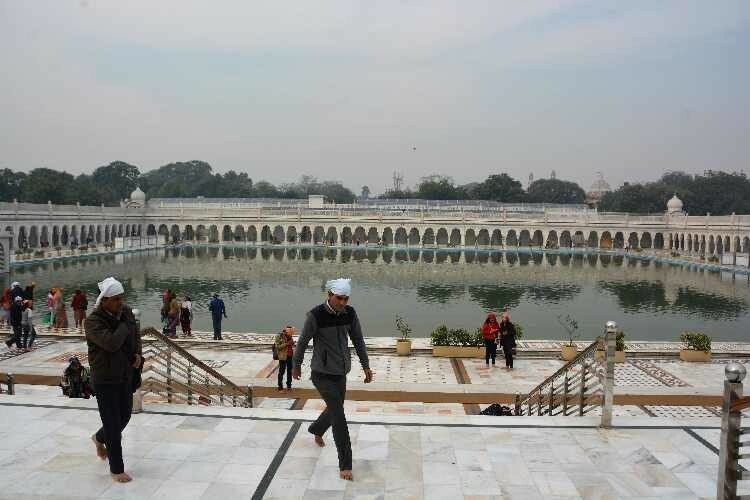 It was first built as a small shrine by Sikh General Sardar Bhagel Singh Dhaliwal in 1783, who supervised the construction of nine Sikh shrines in Delhi in the same year, during the reign of Mughal Emperor, Shah Alam II. After a wonderful Indian lunch, we left Delhi and made the 4 hour drive to Agra where we will visit the Taj and several other attractions. 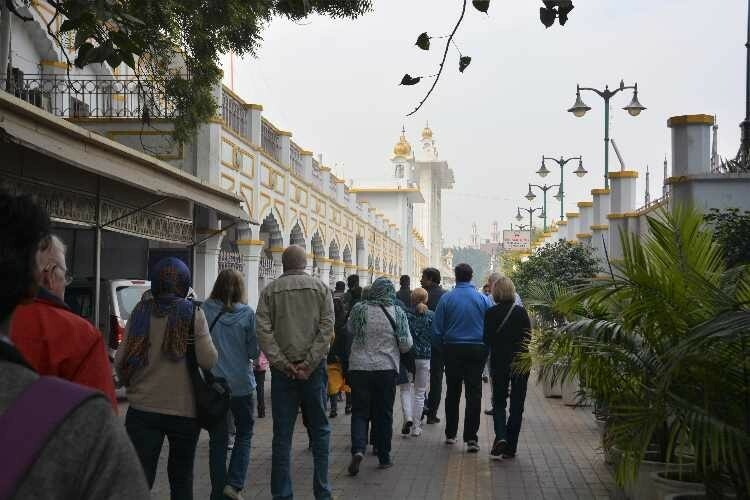 The actual tour started today, and after a briefing, the 18 of us who constitute the group boarded the bus and headed off into the old city from New Delhi. 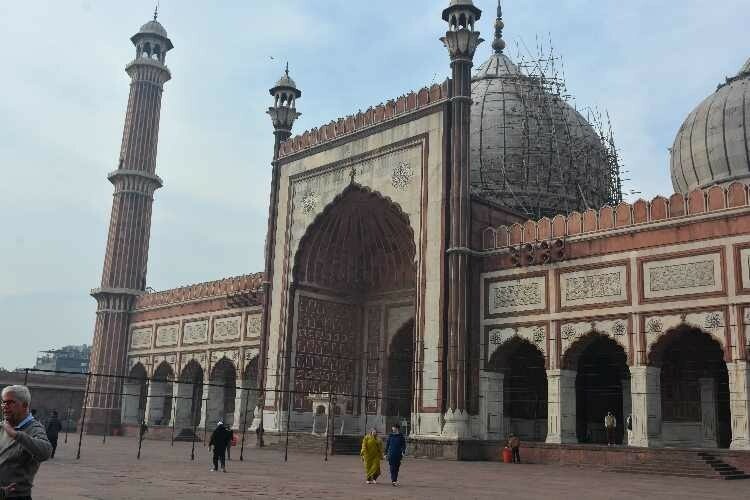 Our first stop was the Jama Masjid Delhi Mosque. 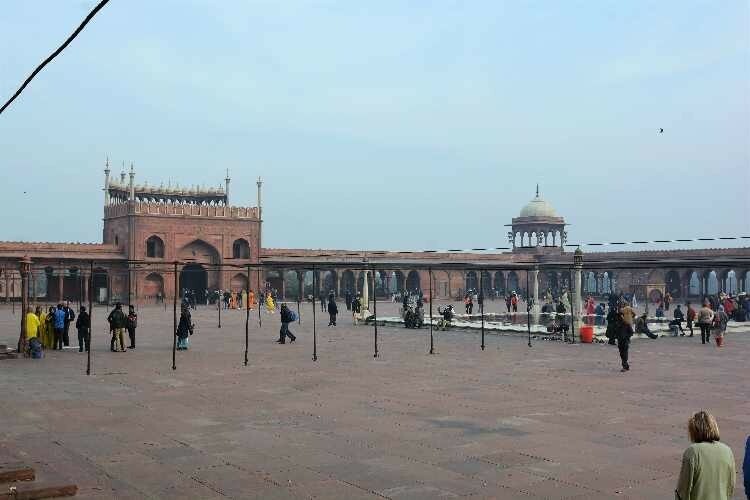 The Jama Masjid is one of the largest mosques in India. 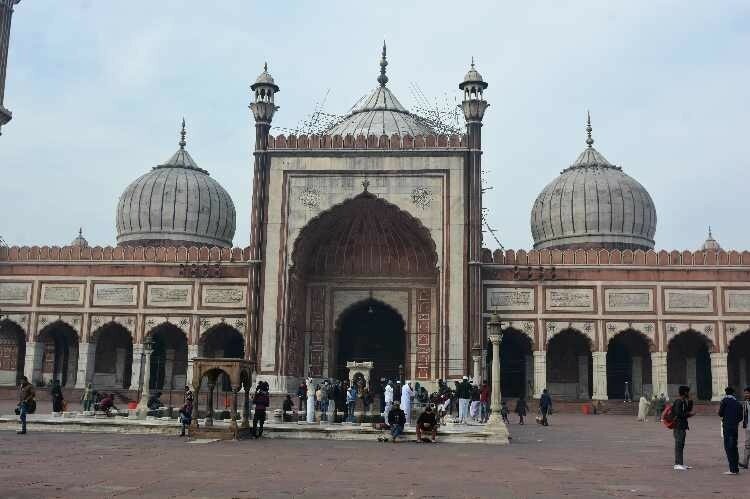 It was built by Mughal Emperor Shah Jahan between 1644 and 1656 at a cost of 1 million rupees, and was inaugurated by an Imam from Bukhara, present-day Uzbekistan.The mosque was completed in 1656 AD with three great gates, four towers and two 40 metres high minarets constructed with strips of red sandstone and white marble. 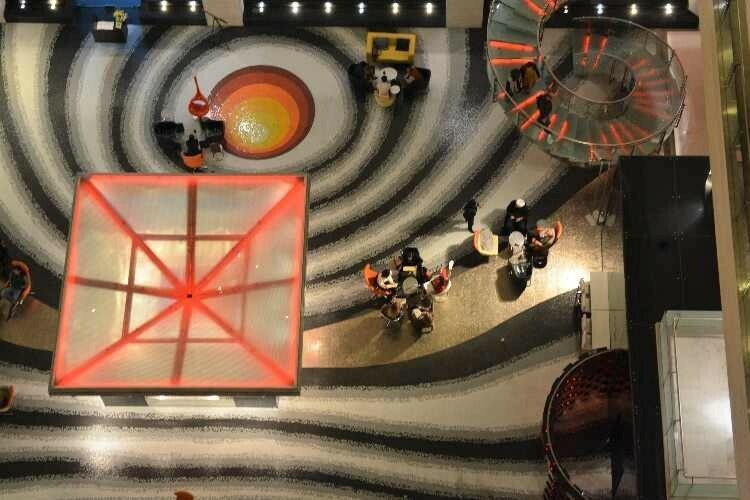 The courtyard can accommodate more than 25,000 people . There are three domes on the terrace which are surrounded by the two minarets. On the floor, a total of 899 black borders are marked for worshippers. 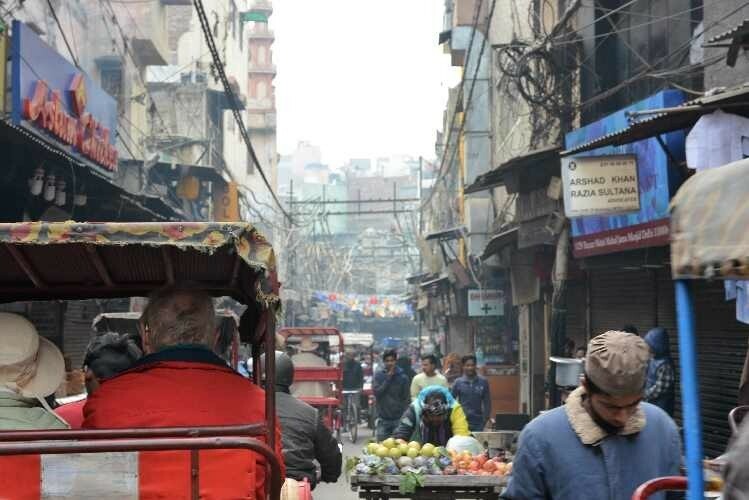 We then boarded some rickshaws for a ride through the amazing narrow streets of Old City Delhi. I was an amazing ride. After the ride, we boarded the bus to visit Mahatma Gandhi's house, where he was murdered. 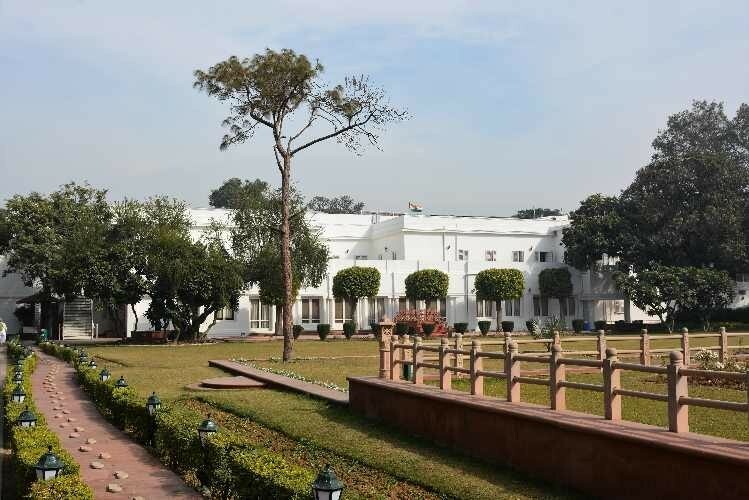 Gandhi Smriti formerly known as Birla House or Birla Bhavan, is a museum dedicated to Mahatma Gandhi, situated on Tees January Road, formerly Albuquerque Road, in New Delhi, India. 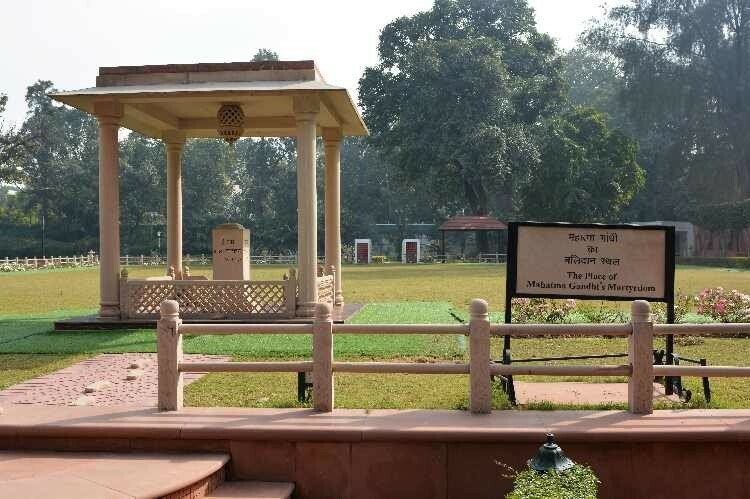 It is the location where Mahatma Gandhi spent the last 144 days of his life and was assassinated on 30 January 1948. 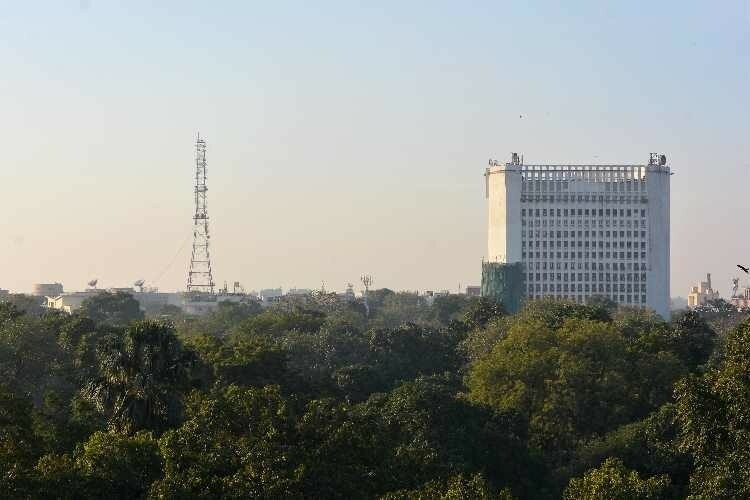 It was originally the house of the Indian business tycoons, the Birla family. 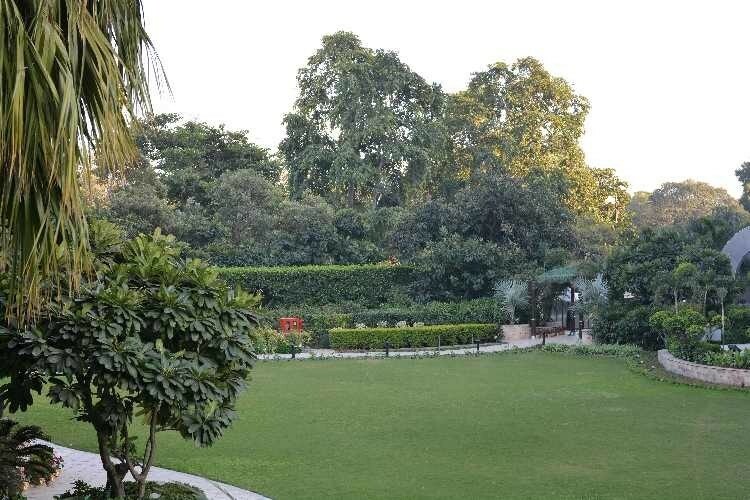 It is now also home to the Eternal Gandhi Multimedia Museum, which was established in 2005. Then off to too much lunch at a local restaurant, we finished our day at Qutb Minar. Qutb Minar, is a minaret that forms part of the Qutab complex, a UNESCO World Heritage Site in the Mehrauli area of Delhi, India. 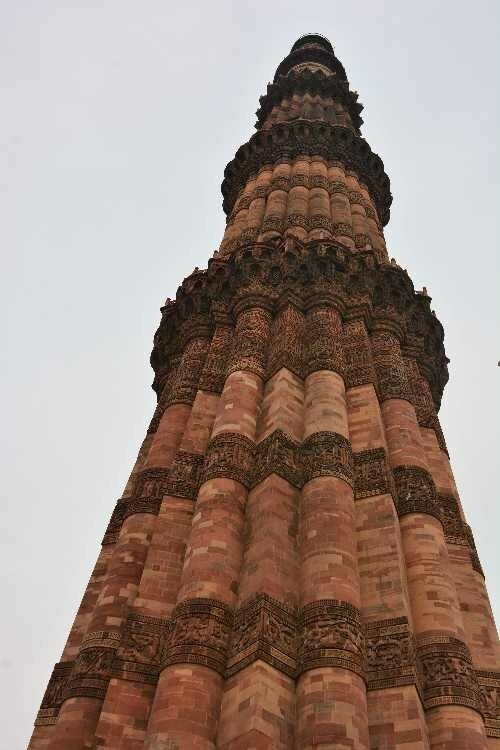 Qutub Minar is a 73-metre (239.5 feet) tall tapering tower of five storeys, with a 14.3 metres (47 feet) base diameter, reducing to 2.7 metres (9 feet) at the top of the peak. It contains a spiral staircase of 379 steps. 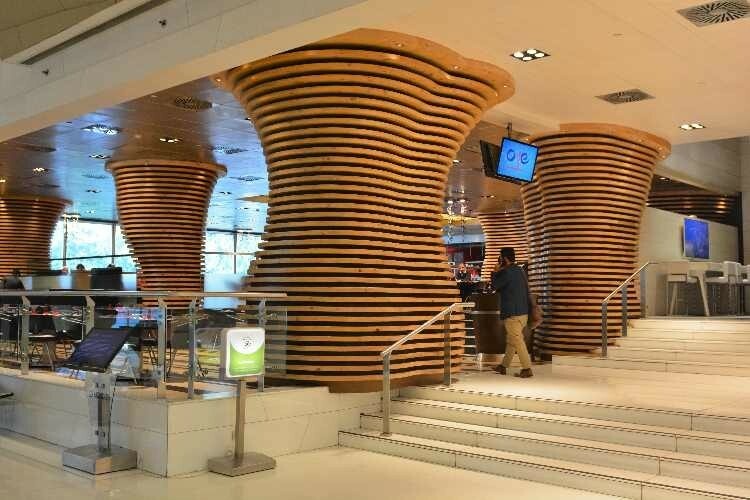 Its design is thought to have been based on the Minaret of Jam, in western Afghanistan. 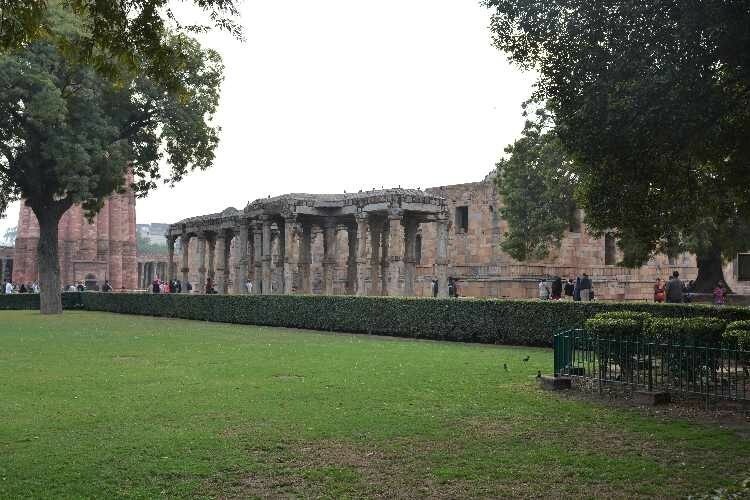 Qutab-Ud-Din-Aibak, founder of the Delhi Sultanate, started construction of the Qutub Minar's first storey around 1192. In 1220, Aibak's successor and son-in-law Shamsuddin Iltutmish completed a further three storeys. In 1369, a lightning strike destroyed the top storey. 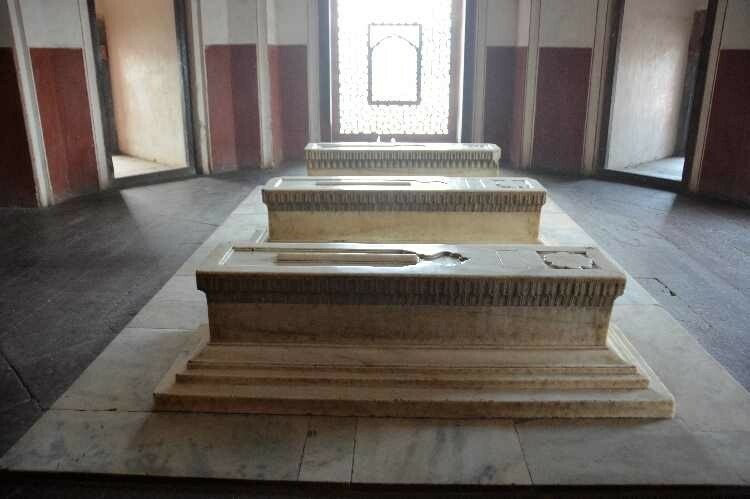 Firoz Shah Tughlaq replaced the damaged storey, and added one more. Sher Shah Suri also added an entrance to this tower while he was ruling and Humayun was in exile. 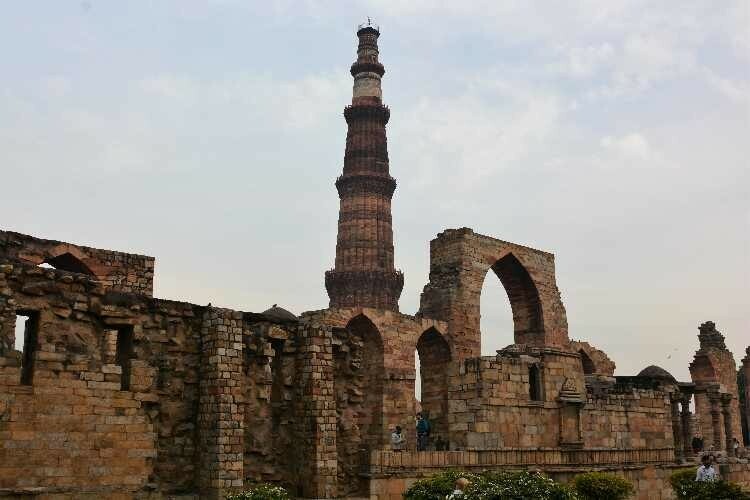 The Minar is surrounded by several historically significant monuments of the Qutab complex, including Quwat-ul-Islam Mosque was built at the same time as the Minar, and the much older Iron Pillar of Delhi. It was windy today so the air quality was quite good on a relative scale. At the moment at 1800 in the evening, the air quality is "satisfactory" according to the Weather Channel. Monday is similar to traditional Sunday in the USA. We were thinking of going to the National Museum and the Mahatma Gandhi memorial, but both were closed. As a result we vegged out watching some Cricket, a hold over from Australia and New Zealand a year ago. The Indians are as wild about Cricket as we are about football and baseball. The structured tour starts at 0830 in the morning. It is a wonderful country so far and we are looking forward to it. 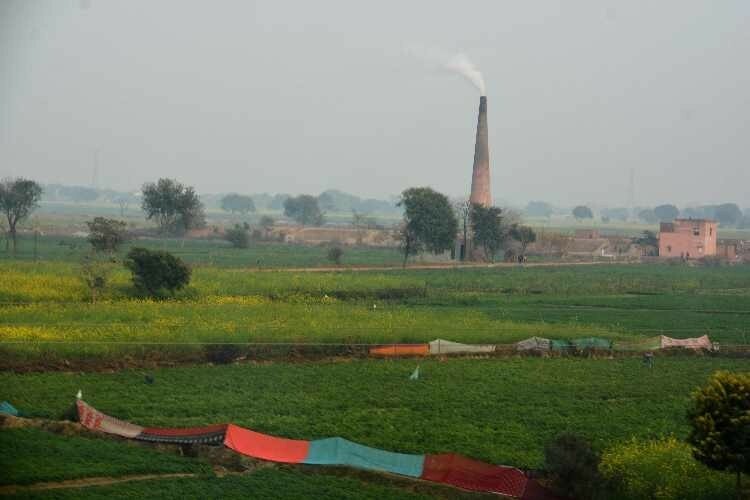 Delhi has been continuously inhabited since the 6th century BCE. 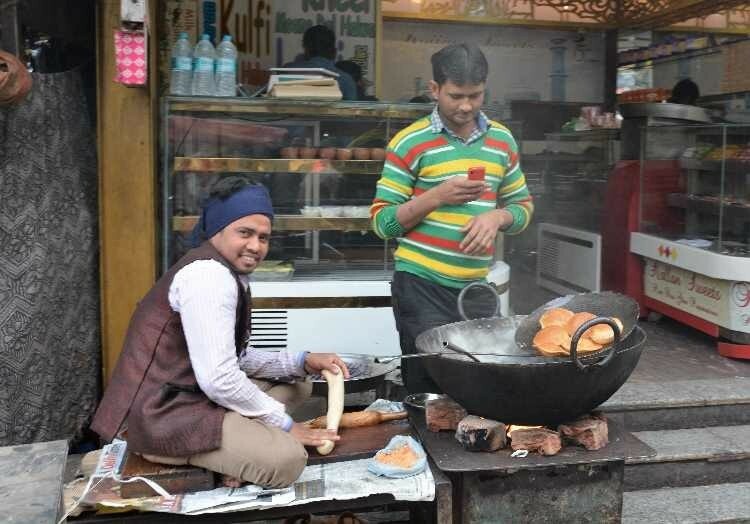 Through most of its history, Delhi has served as a capital of various kingdoms and empires. 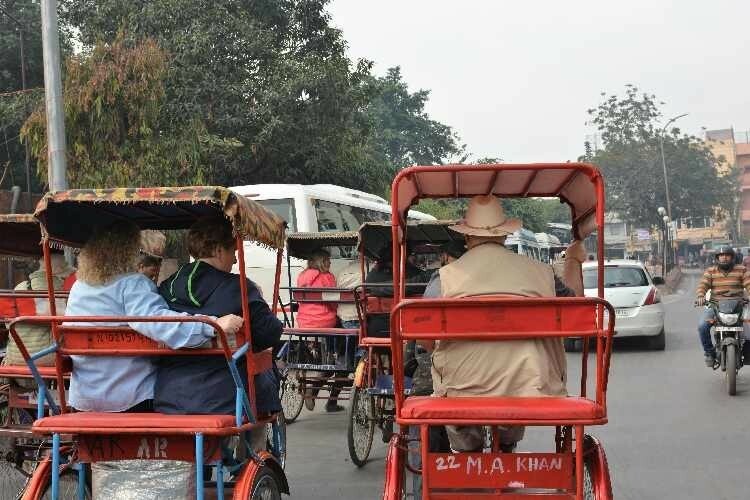 It has been captured, ransacked and rebuilt several times, particularly during the medieval period, and modern Delhi is a cluster of a number of cities spread across the metropolitan region. 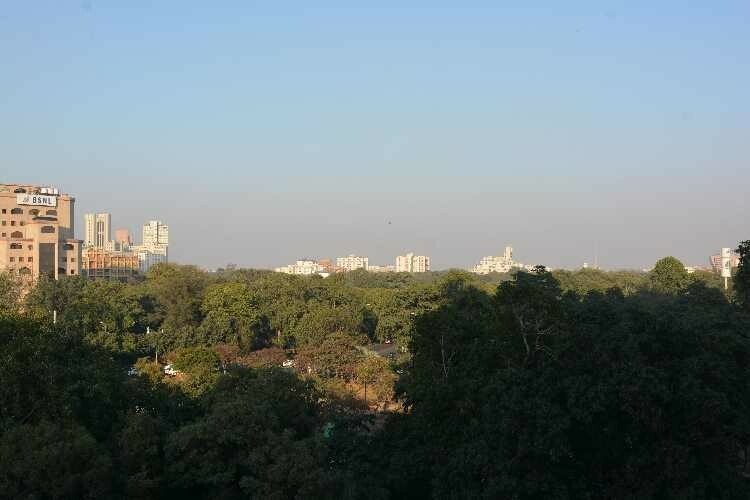 Delhi features an atypical version of the humid subtropical climate bordering a hot semi-arid climate . The warm season lasts from 21 March to 15 June with an average daily high temperature above 39 °C (102 °F). The hottest day of the year is 22 May, with an average high of 40 °C (104 °F) and low of 28 °C (82 °F). The cold season lasts from 26 November to 9 February with an average daily high temperature below 20 °C (68 °F). The coldest day of the year is 4 January, with an average low of 2 °C (36 °F) and high of 14 °C (57 °F). In early March, the wind direction changes from north-westerly to south-westerly. From April to October the weather is hot. 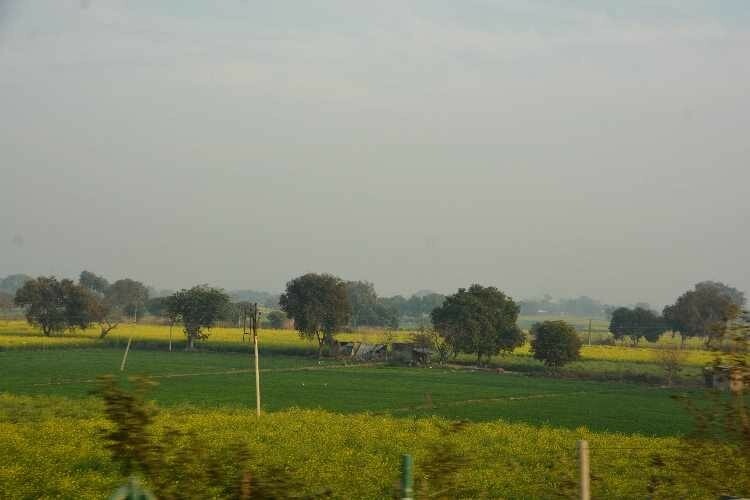 The monsoon arrives at the end of June, along with an increase in humidity. The brief, mild winter starts in late November, peaks in January and heavy fog often occurs. Well, the adventure to India has started. 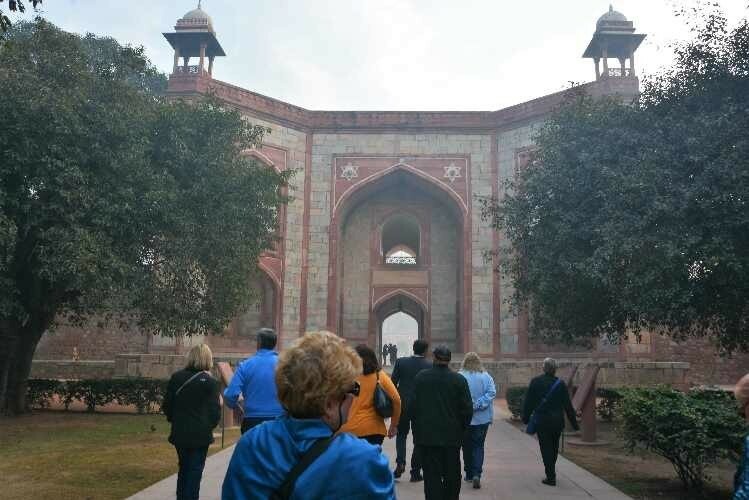 I left the house on January 11, at 8:30am EST and arrived in Delhi at 1:20am on January 13th...about 30 hours of travel...Charleston to Dulles, Dulles to Frankfort and Frankfurt to Delhi. Globus handled our transfer from the airport and the meet and greet was superb. 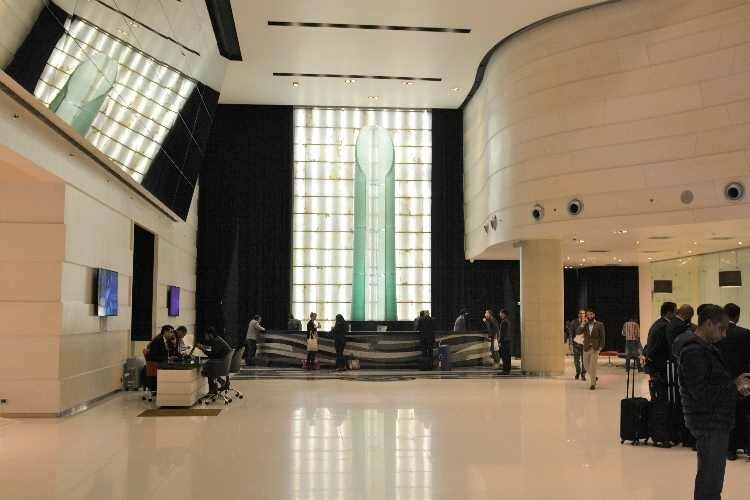 The Indira Gandhi Airport is the largest in India and is a 24 hour per day operation. 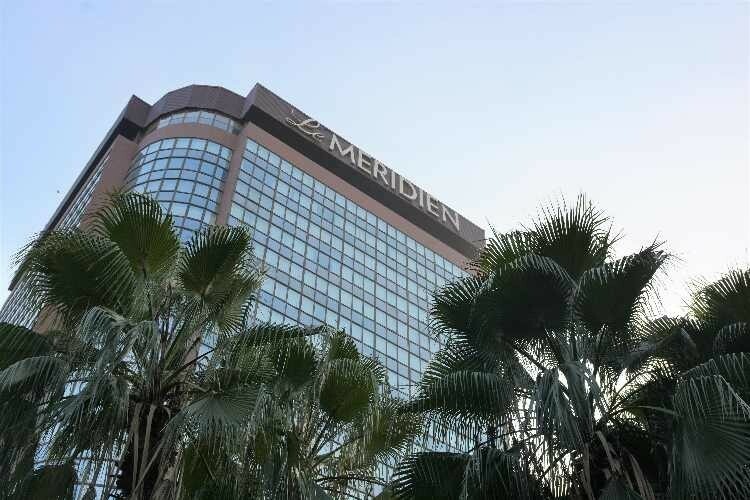 We were escorted to our car, which was waiting curbside, escorted to the lobby of the Le Meridian New Delhi (a Marriott property after the merger with Starwood) and escorted to our room. After a shower we were in bed by 4:00am local. 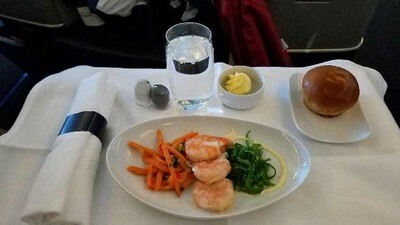 We travelled Lufthansa from Dulles to Delhi. 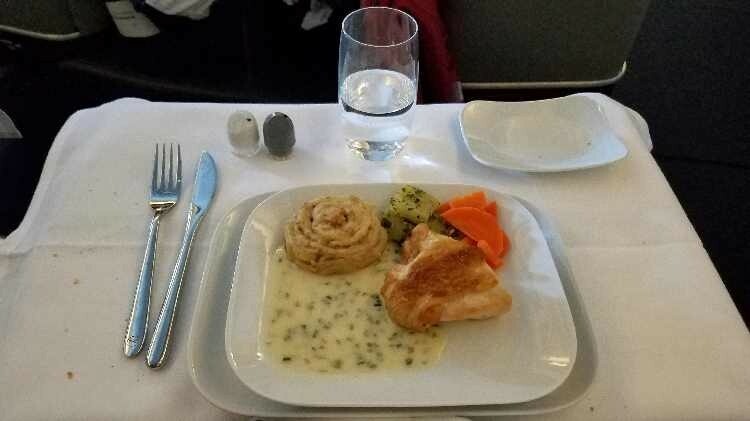 Business class was typical, but the food was superb...perhaps the best airline food I have had...at 747 to Frankfort and an A380 to Delhi. India customs was OK as we had an evisa, which worked well. We have two days to recover, as our first tour meeting in on Tuesday January 15, at 8:30am. 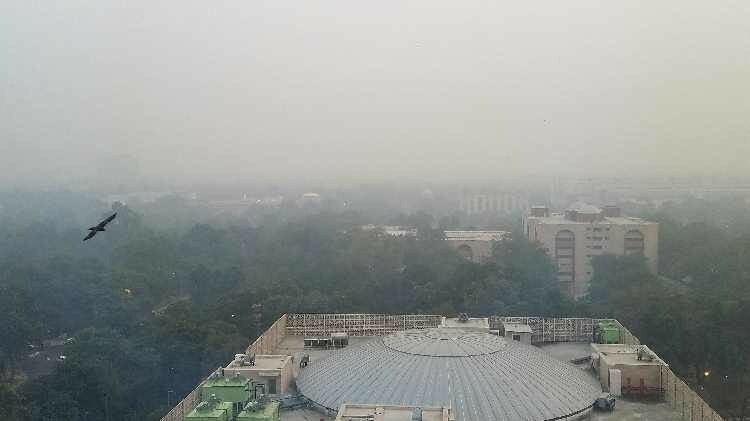 The air in Delhi is horrible - not as bad as Beijing but close (we can at least see the sun). 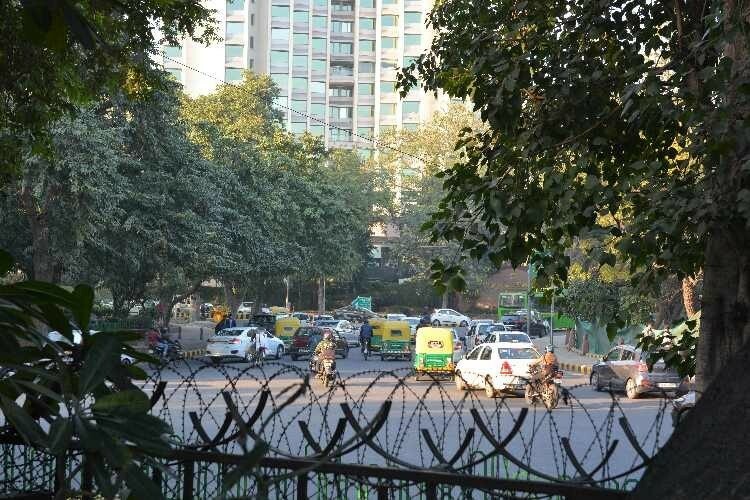 Because of the cast system and the number of people that live in Delhi (20M) labor is plentiful and dedicated. 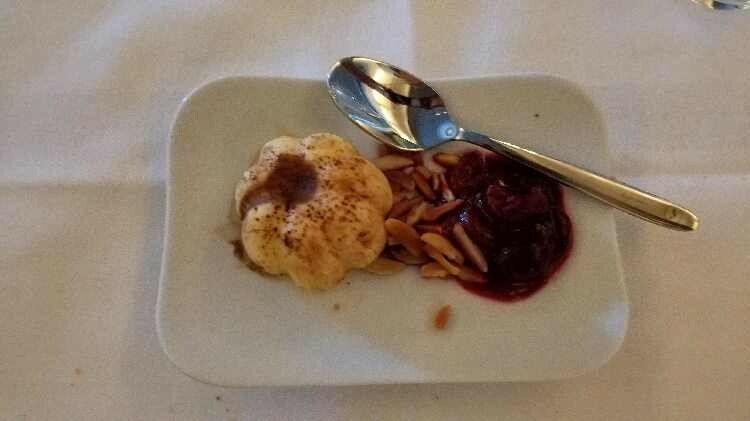 The hotel has probably twice the work force of a similar hotel in the USA, and the service was superb. 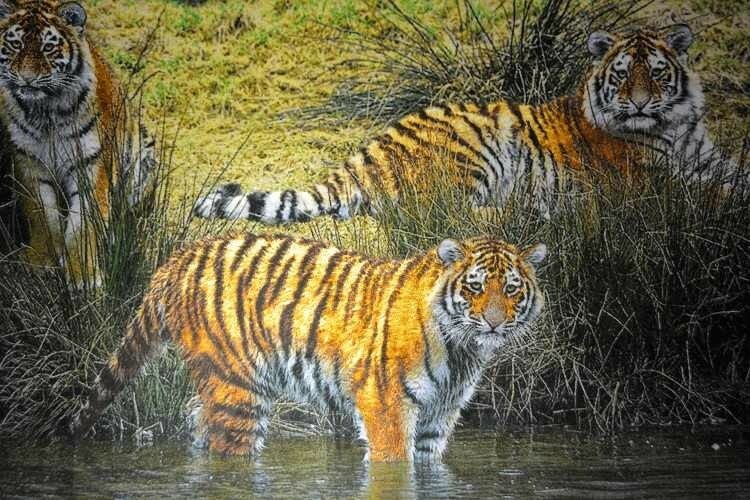 They take pride in taking care of your every need...even if you didn't realise that you had one!